Like the egg industry, the dairy industry is often overlooked by otherwise compassionate diners as innocuous. Some vegetarians even believe that hens and cows live pretty decent lives. But as most vegans will tell you, the horrors that take place inside battery-egg sheds and dairy farms are as egregious as anything that happens in other factory farms ― maybe even more so. Which is why the latest investigation by Mercy For Animals (MFA) is so important. For two months early last year, an MFA investigator worked inside the Willet Dairy in Locke, New York, recording the callous treatment of cows. The largest mega-dairy in New York State, Willet confines 7,500 cows and ships 40,000 gallons of milk a day, mostly to New York City. 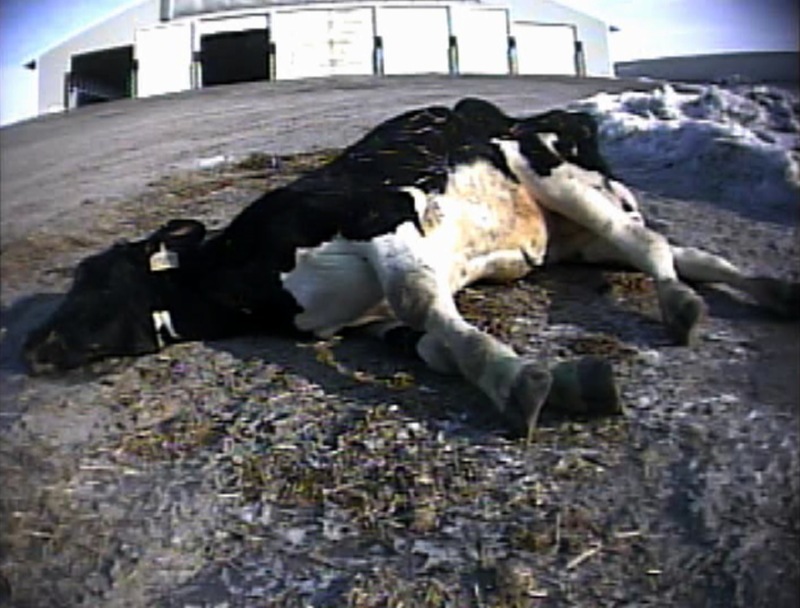 Armed with a hidden camera and keeping a detailed written account, the Mercy For Animals investigator witnessed workers cutting off cows’ tails (tail docking) and burning off their horns (a procedure known as disbudding). The investigator’s notes explain what he observed: “A worker restrains the calves and ties their mouths shut with rope, then burns off the newly budding horns with a hot iron. The calves struggle but, bound and gagged, there is not much that they can do. The worker sticks his fingers in their eyes as he restrains them. They make gurgling noises, kick, and several fall over. Some calves choke up what appeared to be vomit from the pain. “’The cows don’t like it?’ I asked. As a result of their investigation, MFA will be announcing that a new bill has been introduced in New York to ban the practice of tail docking cattle. Assemblymember Linda Rosenthal has submitted the language for this bill, and MFA will be holding a news conference tomorrow at 11:00 a.m. at the Midtown Executive Club in New York City to release the investigation details and to announce the tail-docking ban bill. Portions of the MFA video will be played in reports to be aired tonight (January 26) on ABC World News with Diane Sawyer and later on Nightline. If you’re still drinking cow’s milk and eating other dairy products, please go vegan. You’ll be amazed how easy it is to enjoy a delicious, nutritious plant-based diet. Visit ChooseVeg.com for dairy-free recipes and tips for making the transition to a vegan diet. If you live in New York State, please support the soon-to-be-announced bill that will ban tail docking. Support the work of Mercy For Animals. This is an outstanding organization that relies on the generosity of compassionate people to help fund investigations like this one. Finally, please share this story with family and friends ― it’s important that others know what goes on inside mega-dairies. It would be difficult to imagine a more nightmarish end to any life than what is doled out to animals in slaughterhouses: the smell of death; the sense of impending violence; the unrelenting speed with which workers must stun, kill, and transform one animal after another into products. Even the most graphic video scenes captured by undercover activists are generally recorded within abattoirs that are licensed by the government and subject to some form of oversight requiring that animals be killed humanely. “Killed humanely” may be the biggest oxymoron since “civil war,” but at least the executioners in regulated packing plants are answerable to agencies such as the USDA. And while slaughterhouses are heinous enough, unlicensed slaughter operations subject animals to even more extreme cruelty. Here animals are lucky if they meet their end with a well-aimed bullet. 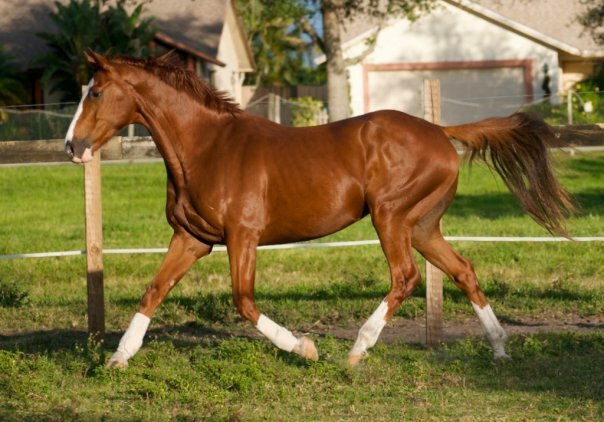 In an unincorporated neighborhood of South Florida’s Miami-Dade County known as the C-9 Basin, illegal slaughterhouses are so ubiquitous that they’ve become a cottage industry, even supplying customers with horse meat, which is a favorite with Miami-Dade’s large Cuban population. 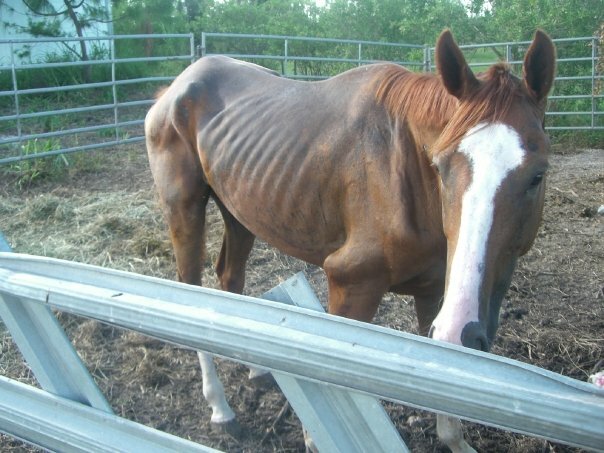 The local love of horse flesh has fueled not only the illicit-slaughter trade but more than 20 gruesome horse killings in the area during 2009; the perpetrators of these crimes are so brazen that they’ve broken into private property and butchered horses right in their stalls. A severely neglected Freedom’s Flight 18 months ago. Images show animals on slaughter farms eating garbage, which Kudo has traced to Cuban restaurants. “This is what they do: They’ll have an agreement with a restaurant, and the restaurant owners, the busboys, and waiters will put the paper waste in one barrel and the food waste in another. They try to separate it, but a lot of the garbage isn’t separated. About every three days the slaughter farm owners will come up to the restaurant and collect the garbage; in return, they’ll sell their meat to the restaurant at a discounted price. I’m talking about whatever garbage you can think of — plastic gloves, rubber gloves, plastic bags, everything.” He also believes local prisons have a similar garbage-for-meat arrangement with illegal slaughterhouses. 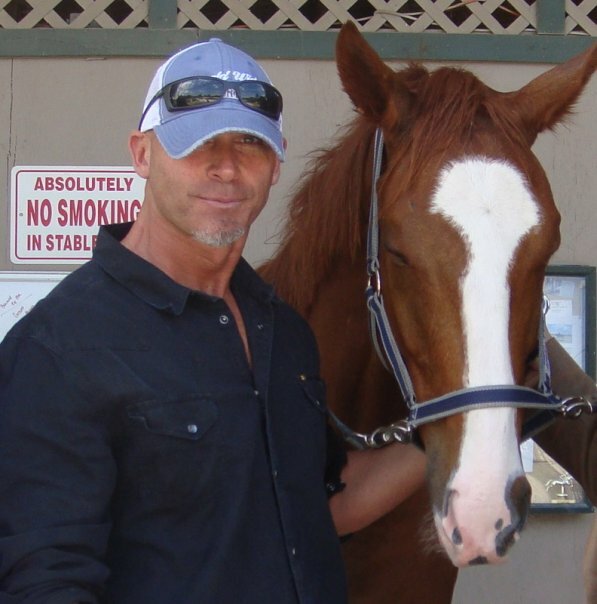 Kudo has listed on his Website a number of county officials you can contact to express your concern about the horse killings and illegal slaughterhouses in Miami-Dade County. You can also add Kudo as a friend on Facebook. Of course, contributions to ARM are always appreciated.